My LG Dishwasher is showing the OE error code on the display. What does it mean and how do I fix it? It runs the dishwashing cycle but always stops right before the end of cycle and shows the OE error. What part or component of the dishwasher will cause this code to show? The Most Common Cause for OE ERROR CODE = DRAIN ERROR. This means the water is not draining out of the dishwasher as designed. 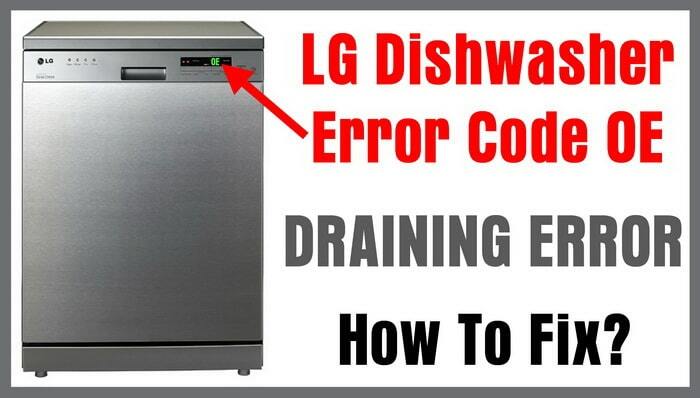 LG has given this error/fault code to show an issue with the dishwasher water drain pump. First, inspect the drain hose for a clog or bend. Second, inspect the dishwasher drain pump for any blockages in the pump housing assembly. Clean any and all blockages and the OE error code should clear. Also check the FLOAT SWITCH inside the LG dishwasher for obstructions. An LG Dishwasher that displays the OE error indicates a DRAIN ISSUE. This means when the LG dishwasher gets to the time for it to drain out water, it is not draining correctly or cannot drain. This is caused by a CLOGGED DRAIN HOSE or a CLOGGED OR FAULTY DRAIN PUMP. The most likely reason an LG dishwasher shows the OE error is the DRAIN HOSE IS BENT, CLOGGED, OR NOT POSITIONED PROPERLY. 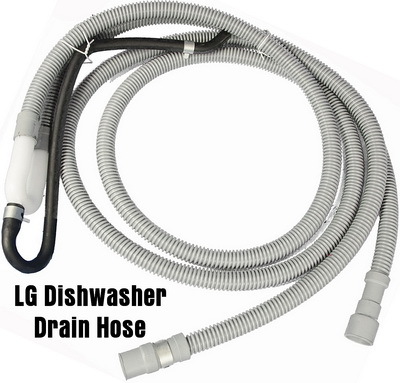 – Be sure the Dishwasher Drain Hose on your LG washer is not bent/kinked. – Check that the Dishwasher Drain Hose is not clogged with food particles. – See if the Dishwasher Drain Hose may not be draining if the wall drain is blocked/clogged. – If you find the Dishwasher Drain Hose to be damaged in any way, remove and replace it. The part that is most likely to be faulty (or blocked/clogged) is the Dishwasher Drain Pump. – Make sure the Dishwasher Drain Pump has nothing blocking it in the pump housing assembly. 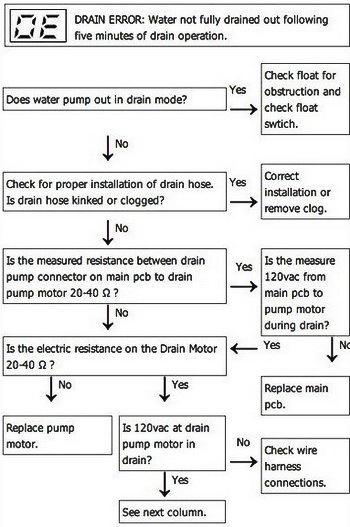 – Examine the Dishwasher Drain Pump for damage such as cracks and breaks. – After thoroughly checking the Dishwasher Drain Pump and the error code comes back then the Drain Motor Pump Assembly may need to be removed and replaced. Checking the drain hose (depending on how the dishwasher is installed) will involve removing the Drain Hose from the bottom of the dishwasher and visually inspecting it. Examining the drain pump will involve removing all dishwasher racks and checking down in sump to be sure nothing is blocking the drain. If all clear, the drain pump will need to accessed to see if food, foreign objects or broken glass is blocking it. Here is a detailed video on how to replace the drain hose on an LG dishwasher. 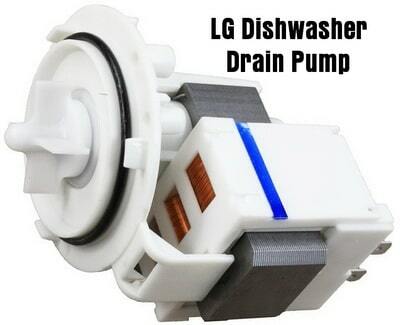 Here is a detailed video on how to remove and replace the drain pump motor assembly on an LG dishwasher. Need assistance? Please let us know by leaving a detailed question below and one of our appliance experts will help! My washing machine is randomly flashing lights on the display and did not start. What would have caused this.